Ok gamers! Here’s your opportunity to have some old school fun. 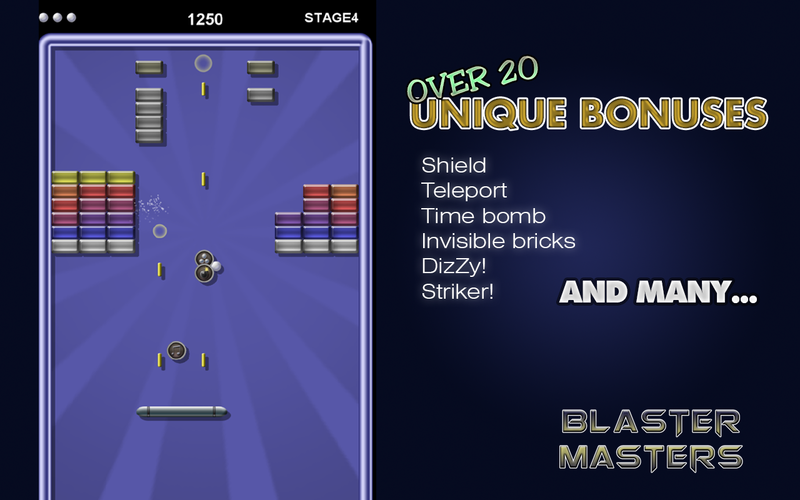 Blaster Masters, by WizioGames, take you on fun, exciting, brick blasting journey. You will stay entertained when playing this Android designed gaming app. As you realize success while playing this game, you will also enjoy over 20 different bonuses to include a teleport, a shield, a time bomb, invisible bricks, a striker, and so much more to help you win in this brick breaking battle. 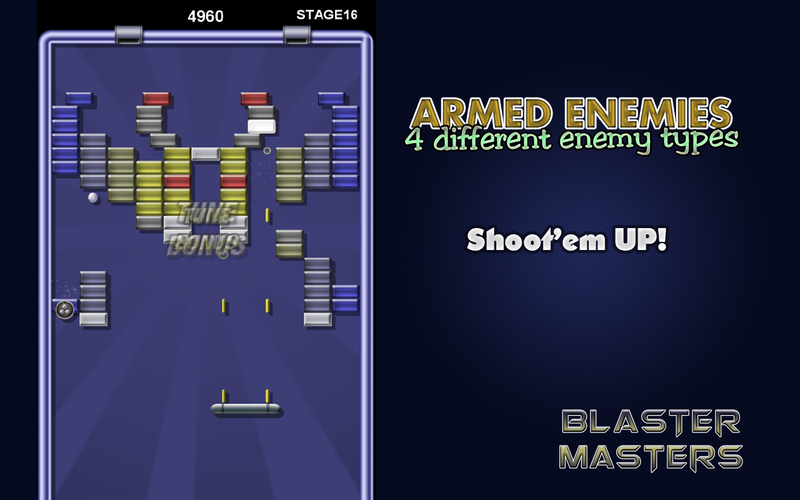 You will face 4 different armed enemies. No worries. You have all you need to shoot them down in great defeat! 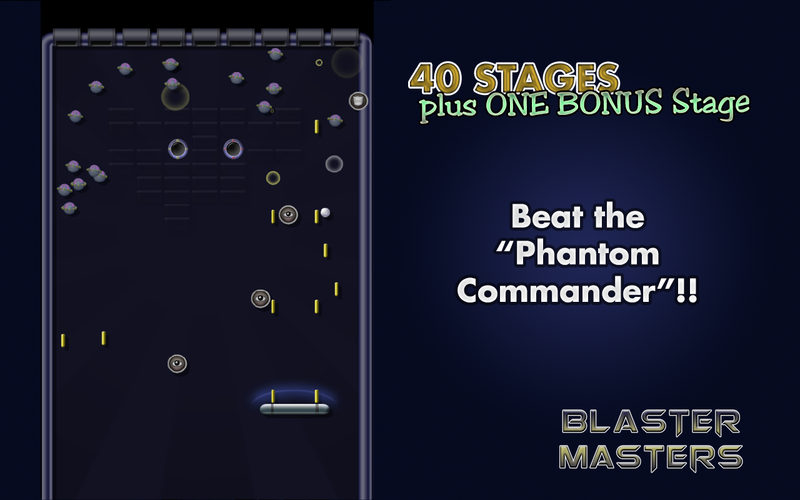 This gaming app has over 40 stages to keep you challenges throughout the entire experience. Plus you will feel it as you get closer to the Phantom Commander, and you will have the opportunity to sit him down in defeat as well. If that’s not enough, you will also have access to a bonus stage. That’s right! There’s a bonus to be enjoyed after 40 stages of pure excitement, brick blasting adventure. The game is designed really well. The coloring and graphics created to bring the game to life, are perfect. The overall design is very clean and the gaming screen is not cluttered. Even with the activity of the game itself, you won’t feel like you can keep up as if there were too many activities going on at once. I especially like the background. You feel like you are in the middle of the universe while blasting bricks. It’s a very neat design feature. What are the additional features you can expect to enjoy? This gaming app is fairly new. Even though the few customer ratings it has received has it boasting 5 stars. If nothing else, that’s a great way to start off. You will need an Android device with an update of 2.1 or better. This game was designed for everyone. What does this mean? There’s no need for parental controls. As a matter a fact, enjoy this gaming app with your kids! You can absolutely make this a family affair. You don’t have to worry about this putting you in a financial crunch. You will be able to indulge in absolute fun for absolute free! This, if nothing else, makes this app a must have. And if you enjoy having some simple, old school, arkanoid type fun, then you definitely need to make this gaming app a part of your portfolio.